Studio Ghibli have a long running tradition of producing high quality merchandise, yet they have mostly shied away from doing collectible figure ranges for any of their films. The main exception to this is the Image Model Collection - a series of large display piece figures from model manufacturer Cominica based on memorable scenes and images from various Ghibli films. 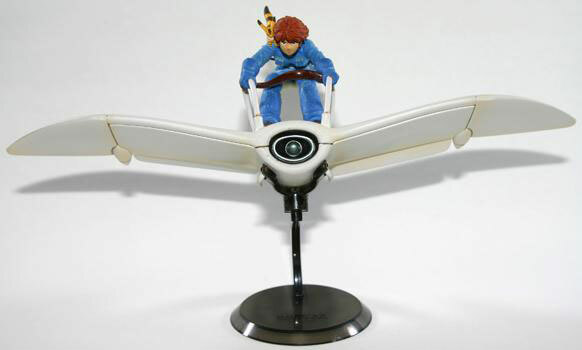 The Image Model Collection VII figure is the only one in the range to focus on the pre-Ghibli Nausicaä of the Valley of the Wind, and it features the film's heroine - Nausicaä - riding her glider with her pet fox-squirrel Teto perched on her shoulder. The figure comes fully painted, and the only assembly required is the snap-together stand, which I will come back to in a bit. The figure itself is probably the best of the collection. It stands at around 5" (12.5cm) tall by around 10" (25cm) wide when attached to the base, and is made of strong plastic with few discernable mould lines. The painting is excellent too, with a high level of detail and some good shading on Nausicaä's clothes and glider, but it is the attention to detail in the sculpting which makes this stand out. 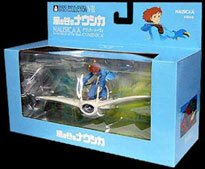 From the clasps on the back of Nausicaä's legwarmers to her stowed gun and Teto himself, the figure really gives the impression of being designed by someone who loved the film - you can even move the aerofoil on the glider's wings and the stand has a ball joint which allows some poseability. There are a couple of flaws though. The first and most obvious is the aforementioned stand, which is an absolute nightmare to clip to the figure and will probably take pliers to remove once attached, and it must be said that the sculptor didn't get Nausicaä's face quite right. Also, the high import duties on goods from Japan puts the price of the figure in the UK somewhere around the £25-£30 mark, which is pretty steep considering it's is made from plastic. At the end of the day I would still recommend this to any anime fan, the overall quality of the figure is very high - far beyond that of most anime figures - and there are some excellent touches of detail that make it stand out. The pose of Nausicaä on the glider makes it a good centrepiece and if you can find it, and have the cash to splash, it is well worth getting - just be prepared for some frustration when attaching the stand!